On the trip to Mongolia, it would have been so helpful to be made fully aware of these tips in order to prepare for being a good houseguest. As it was, a lot of this was simply figured out over time by spending enough time in these fascinating homes, but now we’re giving you the information so you can enjoy your time without the stumbles along the way. 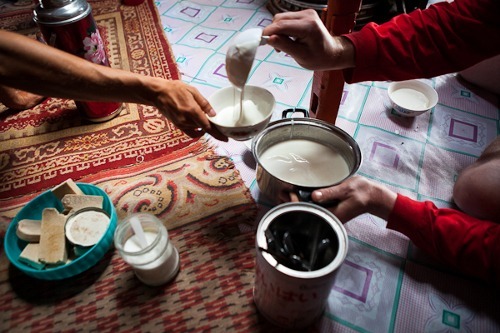 So here’s what you need to know on visiting a Mongolian family. When entering it is impolite to step on the threshold, step across into the yurt itself. Do not hold onto the ropes. Say “Nohio horio” instead of knocking. The fire is the central point of the yurt. When entering the home, always go to the left (right side is the domain for family) and walk clock-wise in the circle. Never put your feet or rubbish in the fire. Every ger has an altar in the back. Never sit with your back or feet towards it. Accept food with right hand or both with left hand supporting at elbow. Don’t lean against a support column. Take a bit of anything offered. Finish your tea (bonus info: everything starts with a cup of tea! It usually has a sour taste from the fermented milk). If you accidentally kick a Mongolian’s feet, immediately shake their hand. This also applies even walking around Mongolia (also important if someone bumps into you and wants to shake your hand). (Personal note: when someone came and shook my hand, it was a major surprise until I understood the custom). Avoid walking in front of an older person. Don’t touch people on the head. Often times you will see what is called an Ovoo, a pyramid-shaped pile of stone and wood placed on top of a hill or mountain during travel in the countryside. If you stop by it, try to add a stone or a few to the pile and walk around it three times in a clockwise direction. You can also make a wish. Ovoos are sacred; they are erected in respect to the gods of the mountains, rivers, and lakes.